Thiruvananthapuram, Jan 23 : The Congress on Wednesday slammed Kerala Chief Minister Pinarayi Vijayan for travelling in a convoy of 28 vehicles including an ambulance. A former Home Minister himself, Leader of Opposition Ramesh Chennithala said he wondered why Vijayan needed so many security vehicles. "This very same Vijayan recently boasted that he fearlessly moved around when people came after him with swords and other weapons. One fails to understand why Vijayan is doing this. 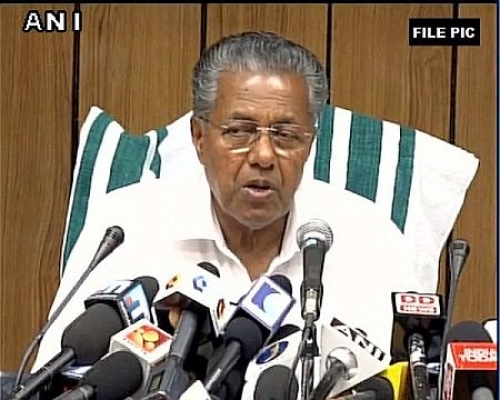 No one is going to do anything to Vijayan," said Chennithala at a sit-in protest outside the state Secretariat here. The Congress-led opposition is holding state-wide protests against what it says is the abject failure of the Vijayan government in rebuilding Kerala following the worst ever floods that hit the state in a century in August last year and against the way it helped women to defy the norms by entering the Sabarimala temple. The protesters who laid siege on the Secretariat were later arrested. Similar protests were witnessed in all 13 district headquarters.